Are you ready to be a winner?! Play Hercules Son of Zeus for your chance to win exciting prizes! There are loads of exciting features that makes this game extra special and extra fun! To find out, just spin the reels and see what you’ve won! Travel back to the ancient Greek civilisation and discover its mythology on Hercules Son of Zeus Slot at Gossip Bingo. It is a 5-reel, 50-payline slot by Pragmatic Play based on a mighty Greek god named Hercules. He is believed to be the son of another deity called Zeus. The game’s backdrop shows the entrance of a Greek temple, with 2 pillars on either side. The reels are set in a blue colour and contain symbols like Hercules, red, blue, green, brown and purple Animal/god representations. Other symbols like A, K, Q and J are also included. The + and – buttons on the Coin Value field allow you to adjust your stake on Hercules Son of Zeus Slot. One to ten coins are also available per line. Click on the Spin button to begin and combine 3 or more identical symbols to win. With Auto Play, you can choose 10, 20, 30, 50, 70 or 100 games that are automatically played. Bet Levels: Levels are unavailable on this slot. Amount of Paylines Selection: The 50 paylines are always active and cannot be altered. Coin Values: The different coin values are 0.01, 0.03, 0.05, 0.10, 0.20 and 0.50. The Greek god Zeus represents Scatter on Hercules Son of Zeus Slot and helps in generating free games. 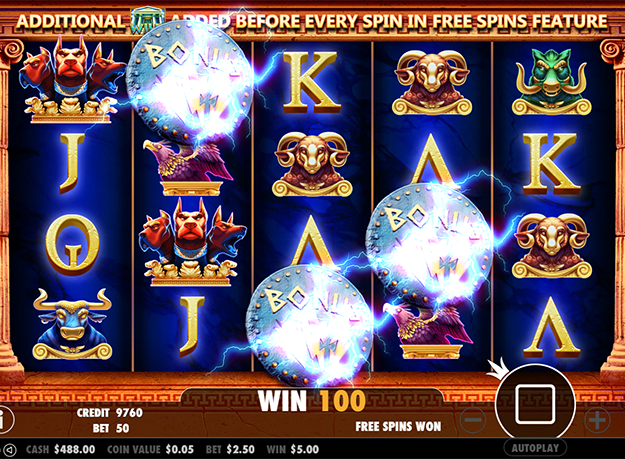 Receive 6 initial free spins when at least 3 Zeus symbols show up on reels 2, 3 and 4. One Wild is also added to these reels and it stays in place until no spins remain. With each Scatter during the round, you can get 1 additional free spin. You can also win an unlimited number of free games! The Temple of Zeus on Hercules Son of Zeus Slot stands for the Wild symbol. It forms winning combinations by replacing any symbol, except Scatter. Don’t forget to play Hercules Son of Zeus Slot at Gossip Bingo, where lots of fun and adventure are guaranteed. All the best to you!